One of the ways companies like to hit up consumers over and over is by charging monthly or yearly subscription fees. That’s usually why most businesses won’t offer lifetime memberships, instead they opt for subscription type services. That way, you have to keep coming back every year and give them more money. It’s a pretty solid business model but does it make sense for the consumer? I really try and limit my monthly and yearly subscriptions. There are so many things that we tend to sign up for and then never end up using: Costco, gym memberships and Netflix just to name a few. But one that’s come in handy for me a couple times lately has been AAA. I know everyone probably already has their own opinion but leave it to me to break down their membership benefits and even find some hidden ones that you probably didn’t know about. The standard benefits are the towing service, locksmith, flat tire repair and battery jump services. Most of the time when I use AAA though, it’s because I locked my keys in the car or I need a jump start. I think changing a tire is pretty easy and anyone with a little do it yourself attitude should be able to change a tire in 10 minutes or less. The only time I’ve called AAA to change my tire is when it’s been raining or I’m on the freeway. I’ve only had to call AAA once because I needed a tow and it wasn’t even for my own car. That’s actually another cool feature about AAA since you don’t have to register your car. They are very lax about who owns the car, as long as a member or member’s ID card is present, they’ll service whatever car is there. The last time we needed a tow was because my fiancee was stranded on the road. I went to meet her but since I couldn’t stay until the tow truck got there, I left my AAA card with her and that worked out just fine. AAA’s classic membership is $48(plus $20 new member fee) and the towing benefits will give you 7 miles for free. 7 miles probably won’t be enough though to get you to your regular mechanic so you’ll likely have to pay extra. Discounts on Entertainment – I always ask hotels and entertainment venues(think fairs, horse races, etc) if there is a AAA discount. It’s never a ton of money but it should save you at least a few bucks. And since it’s normally a per ticket savings, if you have a family, the savings are even greater. Identity Theft Monitoring – I found out about AAA’s identity theft monitoring services from reader Jon a couple years ago and I currently use it as part of my free identity theft protection plan. I don’t think this service is quite as valuable as it used to be, since now Credit Karma and Credit Sesame offer free monitoring, but it can’t hurt to have redundant systems in place. DMV Transactions – Since AAA is a licensed DMV representative, you can go there for certain transactions that you would normally have to go into the DMV for. When I sold my last car, I went into AAA to do some stuff for the title and I was in and out in just 15 minutes. Can’t say that’s ever happened at the DMV. New Battery – The battery in my fiancee’s car died the other day so I let her take my car and I called AAA. They came over and gave the battery a jump but I knew that it probably needed to be replaced. At the local auto store, the cheapest battery I could find was $114. AAA has a new service where they will actually sell you a new battery and exchange it for you on the spot. The cost for an equivalent battery was only $107 so I jumped on it! It saved me a trip to the auto store and I didn’t have to get my hands dirty. Additionally, if you buy a battery from them, it doesn’t count as one of your four yearly service calls. Although the ancillary benefits of AAA are nice, I don’t think they should make or break your decision to buy an annual membership. Having AAA is basically like buying insurance. If everyone used all their benefits every year, then they’d have to raise their annual premiums. AAA is banking on the fact that most people won’t ever have to(or will rarely) use their services. One cool alternative to AAA that I’ve found is my Amex Gold Card. They offer roadside assistance up to $50 per call, regardless of the service provided. I haven’t actually used it yet, but it’s supposed to work like this: you call the number on the back of your card and Amex sends a tow truck out to your location 24 hours a day, 7 days a week. $50 will probably cover keys in the car, flat tire, tank of gas, etc but it won’t even come close for a tow. I’ll probably try out Amex’s service next time I lock my keys in the car and see how they compare to AAA. If you’re not an Amex Gold cardholder though, there are some more creative alternatives to AAA. 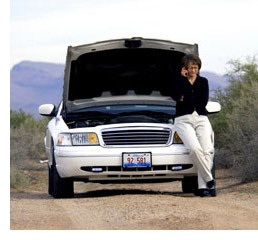 The simplest alternative to AAA when you need a jump start is to just buy jumper cables. They are very easy to use and most people will help you out with a jump if you ask nicely. The cheapest pair of jumper cables I found on Amazon cost $10. That is a lot cheaper than the $48 membership. There’s not a whole lot you can do yourself when you lock your keys in your car since getting them out usually requires a bunch of equipment. I have two sets of spare keys that I keep at home so locking my keys in my car only affects me when I’m away from the house. I think the simplest solution is to just buy a magnetic keycase and stick it under your car with a spare key in it. Alternatively, you could call a tow shop and ask them to come out and unlock your car but that’s probably going to cost at least $20-$40. In San Diego, I used a company called Two Bit Tow. They were dirt cheap since they didn’t use traditional tow trucks, instead they had big pick-up trucks with trailers on the back that they would tow your car with. Finding a cheap tow company might require a little foresight but it could save you a lot of money down the road if you ever need a tow. It may even be cheaper this way than going with AAA since the latter will only cover up to 7 miles. Ultimately, I decided to keep my AAA membership. I used it three times this past year(2 battery jumps and 1 battery replacement). I was always on my mom’s AAA family plan so I only started paying for my membership during the past couple years. More than the costs savings, I like having AAA for the convenience and the flexibility. In my lifetime, I’ve probably used AAA more on other people’s cars than my own and in every instance it has saved a ton of time. I like the fact that AAA contracts with tow shops all over the nation so that no matter where you get stranded, they can have a truck out to you ASAP. I’ve never waited more than 10-20 minutes for a tow truck and when they arrive, they’re always very nice and courteous. For now, I’m going to be keeping my membership. Readers, what do you think about AAA membership? Is it worth it or should you just risk it and go without it? What do you think about the alternatives to AAA that I’ve presented? Is this the longest AAA review you’ve ever read?! We have roadside assistance on our regular car insurance policy that covers most of the same stuff that AAA does and is just $5 every 6 months for our 2 cars. We’ve never actually needed it, but at that price it doesn’t feel worth canceling. Oh cool I didn’t know that insurance companies offered that. That’s definitely a good deal and you’re right. It’s so cheap it’s not worth canceling, even if you never use it. I used to have AAA, but when I got my current car, I got free roadside assistance up to $200 without all of the AAA restrictions. Since I just bought a new to me jeep wrangler, I will need to probably get it again since I won’t have any coverage on it. Oh nice, free roadside assistance up to $200 would pretty much cover everything. Maybe look into Mrs. Pop’s suggestion and see if you can get it for cheap from your insurance company. Otherwise, I think you could probably get by without it if you use some of the techniques I listed 🙂 If you’re a new member you have to pay $48 plus an additional $20 to sign up. We have some similar benefits through our car insurance, but we have never used it. That’s good in the sense we’ve never needed it, but bad in the sense we’ve paid for it. The only thing I’d use AAA for would be the discounts most likely, and I don’t think I’d save enough. Yea the discounts are ok, but I’ve only used the AAA discounts on a hotel once or twice and for saving a few bucks at the horse races. Like others, we have roadside assistance as part of our regular auto insurance. We are insured with Geico. So far, we haven’t needed to use it. Nice, I guess I’ll have to look into a car insurance that provides roadside assistance, might save me a few bucks. Thanks Bryce. I’ve never used AAA but my mom has been using it for probably 25 years! I use roadside assistance from my car insurance provider, USAA and it’s been very valuable when I lock myself out of my car! Nice, looks like I’m gonna have to look into roadside assistance with my insurance company. My husband has a AAA membership. Between the two of us we use it about once every other year. Most recently I needed to call them when I had a flat tire and my husband was having trouble changing it. Every now and then I try to persuade him not to renew his membership, but it sure comes in handy when we need it. Yea that’s the thing, it’s easy to say it’s not that useful until that one time it’s raining and you get a flat on the freeway. That’s when AAA really comes in handy haha!